Among the series of Abdul Wasay’s lectures on Human Physiology. 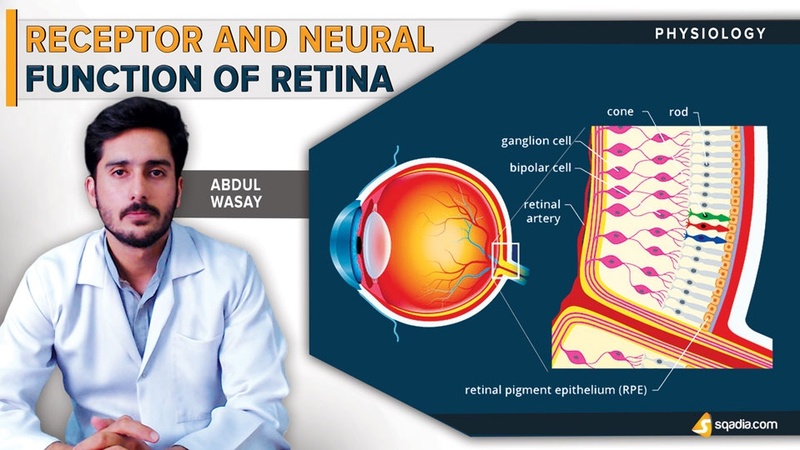 In this lecture Receptor and Neural Function of Retina is explained. Section one is about ‘’Anatomy and Function’’. Educator reveals information about layers of the retina. This is followed by the illustration of foveal region and acute vision. In the last slide rods and cones are presented. Section two is about ‘’Photochemistry of Vision’’. At first, rhodopsin-retinal visual cycle is explained. Then role of vitamin A is described. After that night blindness comes under consideration. Section three is about ‘’Photochemistry of Color Vision’’. Educator’s prime focus in this section is the role of cones. Then automatic regulation of retinal sensitivity is emphasized. Moreover, value of light and dark adaptation is pursued. Section four is about ‘’Color Vision’’. Educator tells about the interpretation by the nervous system. After that perception of white light is explained. Then comprehensive explanation continues on color blindness. Section five is about ‘’Neural Function of the Retina’’. Earlier in this section neuronal cell types are discussed. These include the explanation of the photoreceptors, the horizontal cells, the bipolar cells, the amacrine cells, and the ganglion cells respectively. Then visual pathways are illustrated. Finally, neurotransmitters are discussed.